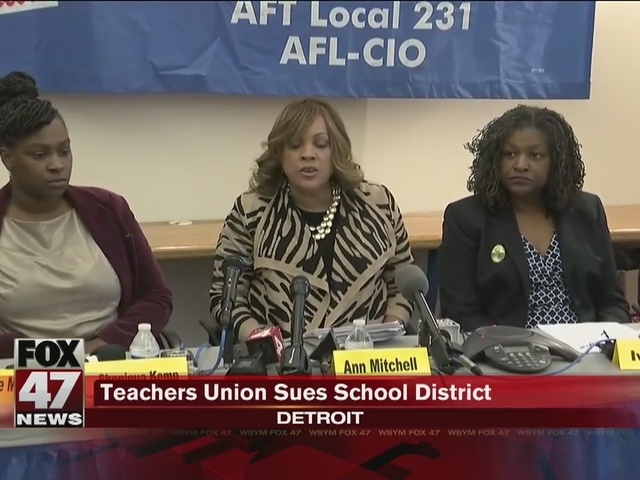 The Detroit Federation of Teachers, along with the American Federation of Teachers, DFT Interim President Ivy Bailey and more, has filed a lawsuit against Detroit Public Schools and Emergency Manager Darnell Earley. Parents of students and some students are also named as plaintiffs in the lawsuit against DPS and Earley. 7 Action News has been reporting on the conditions in DPS schools for months, and in an interview with Earley earlier this week, he pointed out the story exposing conditions in one school was not news to him. The lawsuit also said, “It is not a surprise that due to this, and other reasons, including budget cuts and mismanagement, that DPS is in dead last in academic performance with a majority of its students being left behind the rest of the country." Last week, the city of Detroit posted the inspection reports from 11 schools from Jan. 12 to Jan. 17. Each school inspected was found to have multiple violations. Nine schools had damaged or falling ceiling tiles while five schools had a rodent problem. Four had leaky roofs and three had heating issues. In the complaint, DFT mentions several DPS schools with bad conditions, included previously mentioned Spain Elementary, as well as Osborn High School, Carleton Elementary, Dossin Elementary-Middle and many more. The complaint also features statements from teachers at the school with the bad conditions. Other examples include pictures of rodent droppings at Dossin and bathroom equipment that doesn’t work at Osborn. Also mentioned in the complaint is Detroit Mayor Mike Duggan who was on the tour of the schools. With the lawsuit, DFT is hoping that the court will remove Earley from his duty as emergency manager and restore local control over DPS. Also, they want the court to force DPS to perform periodic inspections, investigate complaints filed by parents and teachers and fix all code violations found by the city of Detroit.